Saving your email messages from Microsoft Outlook to your Windows desktop is easier with the MessageExport add-in by Encryptomatic LLC. This article will show how you can save Outlook emails to your Windows desktop as .msg files. We'll look at how this is done using Outlook directly, and the advantages of using the MessageExport add-in for Outlook to accomplish this task. Our example will be using Outlook 2013. The easiest way to save a message outside of Outlook is to just drag it from the maillist and drop it to your desktop. This method works well when converting one or a few hundred emails to .msg files. The resulting .msg files will be named for the email subject line. There is no method in Outlook to customize the file name. Using MessageExport to save Outlook email as .msg files. MessageExport is an add-in for Microsoft Outlook. It installs as part of Outlook's menu system. It has many powerful capabilities for converting and copying Outlook emails. With MessageExport, you can convert one, or thousands of Outlook emails to .msg, .pdf and many other formats. The resulting files can have a custom name which may include concatenated fields from the email, such as sender's email address and date received or subject. The combinations are endless. Customize .msg file names with MessageExport. MessageExport is $79.99 for a single license. A 15 day trial is available. 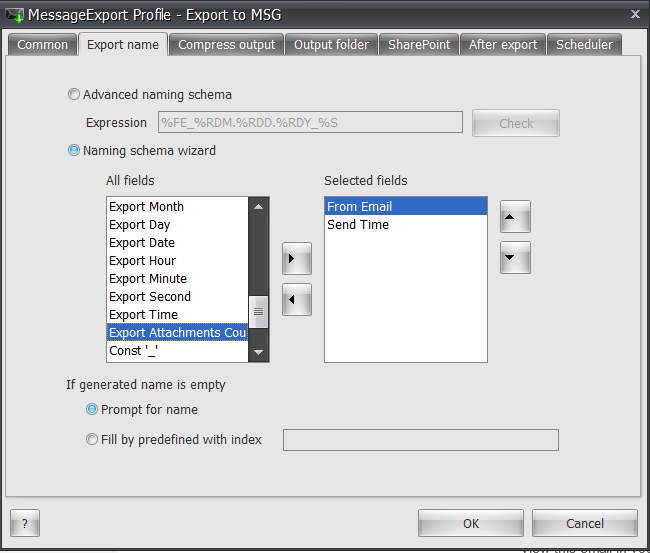 Learn more about MessageExport.